This is a sign I'm carving for the artist's co-op I belong to. 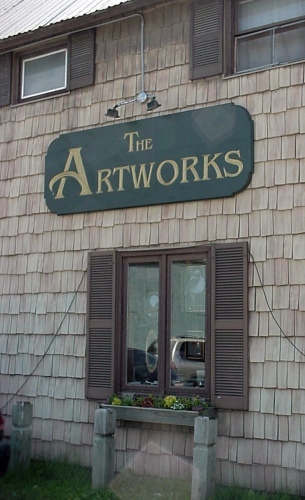 The Artworks is a shop in Old Forge, NY. As part of membership, I'm up there 1-2 times a month... come visit. No, I don't usually carve in a tie. I'm close enough to my place of work that I biked home for lunch and almost completed the 'w'. The swing set turned out to have a chickadee nest in the right hand tube. 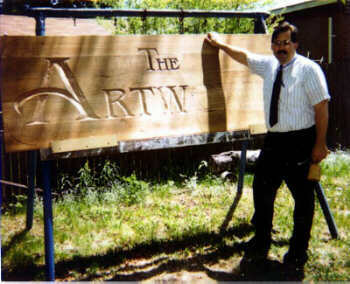 Fortunately, they seem to tolerate my using their home as a carving easel, even with the mallet work.